We have a lot of fantastic authors at OneFour KidLit and are excited to introduce them all to you. One author, four questions. Today we’re talking to Veronica Bartles, author of TWELVE STEPS. Here we go! I wrote my first novel in 2008, when a speaker at a women’s conference gave me the courage to let go of the paralyzing fear of failure and pursue my lifelong dream. After a year of revision and polishing, I started querying that manuscript… and discovered that I still had a long way to go before it was really ready. I put it aside and wrote something else. And then another something else. And another. But I couldn’t get that first story out of my mind, so I pulled it out of the drawer and totally rewrote the entire thing, keeping only a line or two from the original manuscript. And I got really close with my queries this time around, but after a handful of encouraging rejections, I convinced myself that this manuscript would always be the one that was almost good enough, but not quite there. Since I wasn’t ready to say goodbye to the characters yet, I decided to let go the same way I started. I devoted NaNoWriMo to writing a separate story, from the perspective of the little sister in my first novel. This was supposed to be something just for my own kicks and giggles, and I told myself that when November was over, I’d put both stories away and say goodbye to these characters forever. But instead, I fell in love all over again. And when I revised and polished this manuscript, and entered a few online pitch contests with it, the requests started pouring in. In July, I accepted an offer of publication with Swoon Romance. When Andi’s crush asks her to fix him up with Laina, Andi decides enough is enough, and devises a twelve-step program to wrangle the spotlight away from Laina and get the guy. But when a stolen kiss from her crush ends in disaster, Andi realizes that her twelve-step program isn’t working. Her prince isn’t as charming as she’d hoped, and the spotlight she’s been trying to steal isn’t the one she wants. One very “cool” detail is that Andi and Jarod (her crush) go out for ice cream in the middle of the winter. In Wyoming. So that’s more than just cool, it’s downright freezing. Andi is a secret history nerd. She models her life on her favorite quote by Thomas Jefferson: Nothing gives a person so much advantage over another as to remain always cool and unruffled under all circumstances. I’m a full-time mom with four amazing kiddos (ages 9, 11, 13 and 15), who keep me running around like crazy. Luckily, they also fully support my writing and send me to my desk to work if I procrastinate too much. When I’m not writing, reading or shuttling kids around, I’m usually found in the kitchen, creating new and fabulous recipes for my crock pot, as well as delectable desserts. I also enjoy knitting with recycled materials, like plastic bags, old t-shirts and discarded video tapes. I’ve knitted (and written my own patterns for) pretty purses and tote bags, jewelry, toys and even hats! 1. I write all of my rough drafts by hand, with the special pencils I’ve been collecting since I was in third grade for the express purpose of writing “my first published book.” The first draft for TWELVE STEPS took four full pencils (one of which came all the way from France) to write. 2. Although I’m outgoing and friendly, I’m secretly terrified of people, and I have a mini panic attack every time I have to start a conversation – even if it’s with one of my closest friends. However, writing confident, brave characters has helped me to find some hidden bravery in myself. And sometimes, when I’m feeling particularly nervous in a social situation, I’ll adopt Andi’s confidence to get me through. Veronica Bartles lives in New Mexico with her husband and four children. When she’s not writing or lost in the pages of her newest favorite book, she enjoys creating delicious desserts, exploring new places, and recycle knitting. 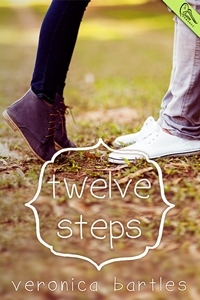 Her debut novel, TWELVE STEPS (Swoon Romance) will be released in March 2014.